Being my first really in-depth dive into using the Oculus Rift, I was a little hesitant about putting the headset on for a long period of time and jamming about in my spare bedroom. I was equally as hesitant about reviewing one of my first Early Access titles for Wccftech, unsure of just how much content developers Hyperbolic Magnetism could put into their first VR title. Still, the game is currently the highest-rated on Steam with an astonishing 99% positive user score, which made a compelling case to check it out. The premise for their VR-exclusive rhythm experience is as bloody simple as the name itself: Beat Saber. Sabers that can cut along to the beat, what could be simpler than that? It’s as rare as a four-leaf clover in Winter that every song in a rhythm game is an absolute banger. Beat Saber is one of those rare experiences where, no matter which song you decide to draw your virtual steel to, you’re going to find yourself lost in the beats. I never thought I’d see the day where I’d be excited about a country track, but Squeepo’s remix of Country Rounds is hands down my favorite track in the modest track list. 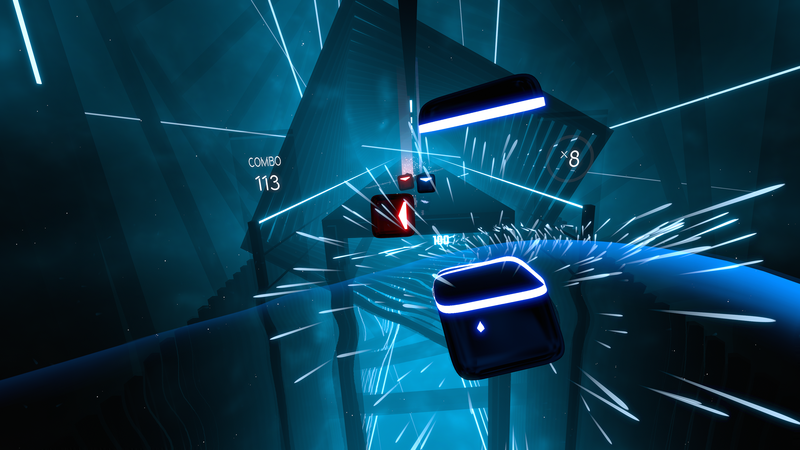 While the current offerings is only ten songs deep, the developers made the important distinction that Beat Saber is in Early Access with more songs and levels to come. At the current price of $2/song, that puts in line with Rock Band’s pricing structure but with the added charm of every song being absolutely euphoric to play in Oculus VR. Aside from the beats that scroll past your eyes and a pair of lightsabers that can carve them apart, the presentation to Beat Saber is otherwise null. A handy score and combo counter are visible on-screen at all times, but when you’re too focused on getting into the rhythm, they’re easy to miss. 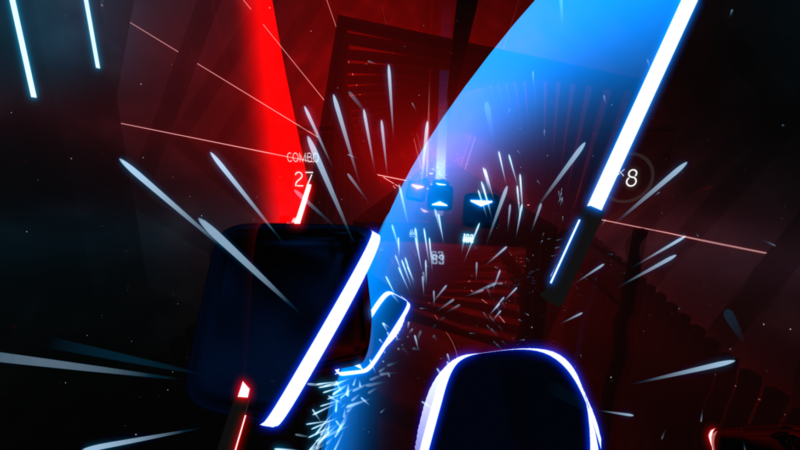 Facing the beats head-on is all you need to prepare yourself for in Beat Saber and having the free space to carve in any direction. As the Beat Saber notes scroll into your HUD, it’s up to your color-coded pair of lightsabers to cleave them in two. Most notes require a directional cut with that particular blade, but the movements to each song all feel natural. In addition to carvable notes, various obstacles lie long the note track, from plasma walls to sidestep or duck under to mines that require remaining otherwise still to pass through. The combination of note directions and obstacles to avoid get you up and moving and grooving to the virtual beats in a fun cardio workout that won’t even feel like you’re exercising. Each note chart in Beat Saber is lovingly crafted across all four difficulty levels and fit the tunes oh-so-well. All ten songs have a very distinctive style from one song to the next; some require twirling the blade about to hit a stream of notes, others require Any time the beat drops, you can be sure of a flourish of illuminated beats that feel nothing short of amazing to carve up. During some of the faster tracks, it can be a chore to figure out what direction to cut away, but repeated playings can drill that into your muscle memory, or, if you aren’t one to care about topping the leaderboards, a mode can be toggled on to eliminate the need for directions entirely (as well as the option to play one-handed if dual-wielding lightsabers is too exerting). After barely an hour of playing Beat Saber’s modest song lineup on Hard (and Expert in its No Fail mode), I was sweating bullets and my arms felt like jelly. In the midst of playing through my favorite tracks, I barely noticed the amount of exercise my body was going through. The fact that I could enjoy the game for so long and have it barely feel like any amount of cardio or exertion is a testament to just how fun Beat Saber can be. Even when flailing around to the beat and stepping from side to side or crouching under an oncoming wall, this rhythm game doesn’t feel much like exercise. The comfort from wearing the Oculus Rift for an extended period of time didn’t take any toll on my body even for my impromptu marathon session. While some other VR titles can bring about a headache in any matter of time, I didn’t find myself with any such issue in Beat Saber. I was concerned that I’d need to put my Reliefband to good use again in order to enjoy this rhythm experience and was pleasantly surprised otherwise. Perhaps it’s the minimalistic presentation or how responsive all of the motion is displayed into camera movements, but either way, this is one of the comfiest VR experiences I’ve played on the Rift. The initial setup claims to need a space roughly seven by five-feet, but as long as you’ve got a space where you can take a step to either side and flail your arms without hitting anything, you’ve already got enough space to play. Review code provided by the publisher. You can purchase the game on Steam Early Access. 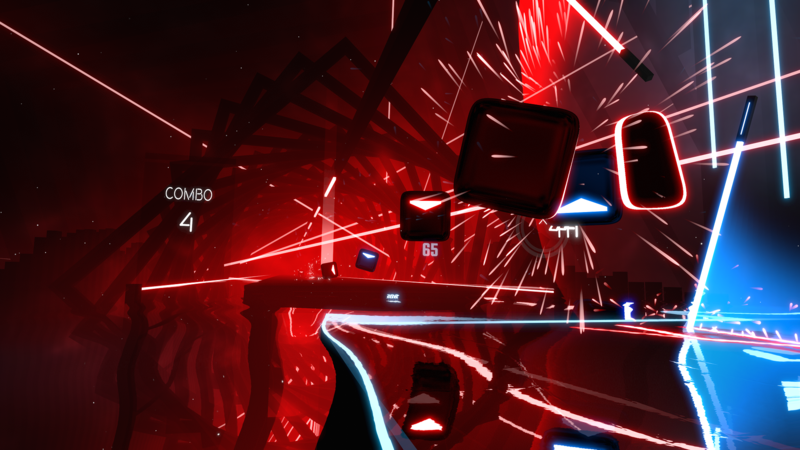 The simple fact that Beat Saber is in Early Access shouldn’t deter players that want to hop into the virtual space and get immersed in the music. More modes and plenty more music (and a song editor) would be incredible additions, but there’s still plenty more to come from Beat Saber. What players can get in their $20 purchase of Beat Saber is a rhythm experience that’s swiftly becoming one of my absolute favorite experiences on the Oculus Rift and it can only get better going forward.